One thing leads to another...after making revel bars, I thought I'd make another bar dessert that I've had on my list for a long time: chocolate mint bars. Since St. Patrick's Day is coming up, a touch of green seems appropriate right now. Clearly, I embrace all kinds of excuses to make treats! 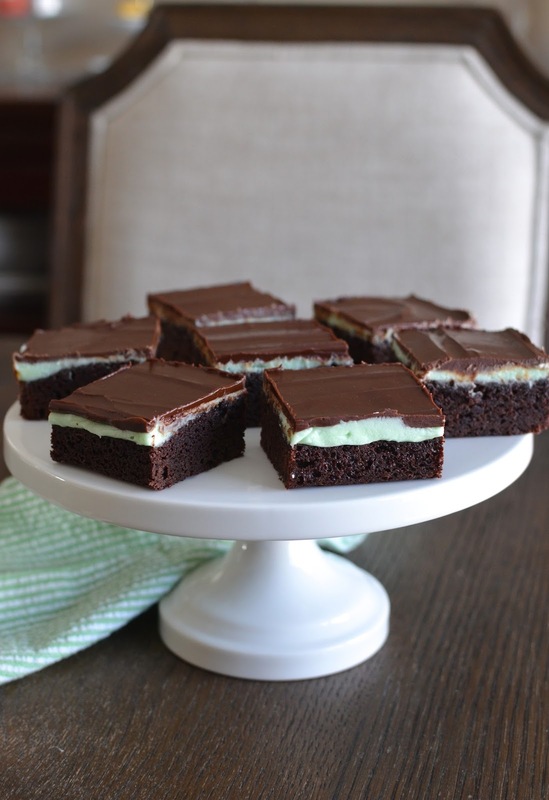 I had my son in mind for these because he is a big fan of the chocolate + mint combination. These 3-layer treats feature a base layer of chocolate cake/brownie, followed by a cooling and sweet layer of mint frosting, topped with (my favorite part) a chocolate glaze. The chocolate mint bars I made are a result/collaboration between a couple of recipes. I based them off of both recipes from Hershey's (this one as well as this) and one from Cooking Light. Typically, you'll see chocolate syrup used for the base layer but I found a Hershey's recipe that used cocoa powder instead, which I preferred. I scaled the recipes down and made a few tweaks here and there. In the end, I had an 8x8" pan of these minty chocolate bars that I've been meaning to try for ages. It's clearly all about the layers, which marry together so well. Bite into it and the first thing that hits me, and what lingers, is that creamy chocolate glaze on top...that's my favorite part. And the minty flavor is always refreshing and works so well with chocolate. It's a time honored classic for obvious reasons. So call it frosted mint brownies or mint chocolate cake you can eat with your hands...either way, it's a tasty little treat! I think part of the reason I took so long to make these bars was I felt they were complicated. In reality, that's not the case at all. I was confused by the recipes I saw, my desire to scale it down, and with trying to figure out a way to make it without using store-bought chocolate syrup (I actually keep homemade chocolate syrup in my fridge but wasn't sure it would work for the recipe). I can now say I've figured it out! And the best part...you can make it without plugging in any equipment. I made all the layers using basic things like a bowl, whisk, and wooden spoon. The only thing is a bit of a time commitment, waiting on the layers to cool/set before continuing. Baring that in mind, it's pretty much a snap! I sliced my pan into 16 little squares. That's plenty to enjoy for a few days and to share with friends. For base layer: Preheat oven to 350 degrees. Grease and line an 8x8 inch baking pan with parchment paper, allowing for overhang on two sides. Place butter in a large microwave safe bowl. Microwave on 50% power for 1-2 minutes, or until melted. Stir in sugar and vanilla with a whisk or wooden spoon. Add eggs, beating well to combine. Add cocoa, flour, baking powder, and salt, beating until just incorporated. Scrape batter into the prepared pan and bake until a cake tester comes out clean (or with just a small amount of moist crumbs), about 20 minutes. Let cool completely. For mint layer: Place all ingredients in a bowl and stir vigorously with a wooden spoon until fully combined and smooth. Spread evenly over the cooled cake layer with a small offset spatula. Cover and let chill in the refrigerator until cold. For glaze: Place chocolate chips, instant espresso powder (if using), and butter in a microwave safe bowl. Microwave on 50% power, stirring every 30 seconds, until melted. Spread evenly over the top of the mint layer. Cover and refrigerate for at least 1 hour. Lift bars out of the pan and slice into squares using a warm serrated knife. Bring bars to room temperature before serving. I love the combo of chocolate and mint. These bars look very inviting! Love these bars! Chocolate and mint is such a favorite around here! All those layers look delicious - these bars would disappear so quickly around here! 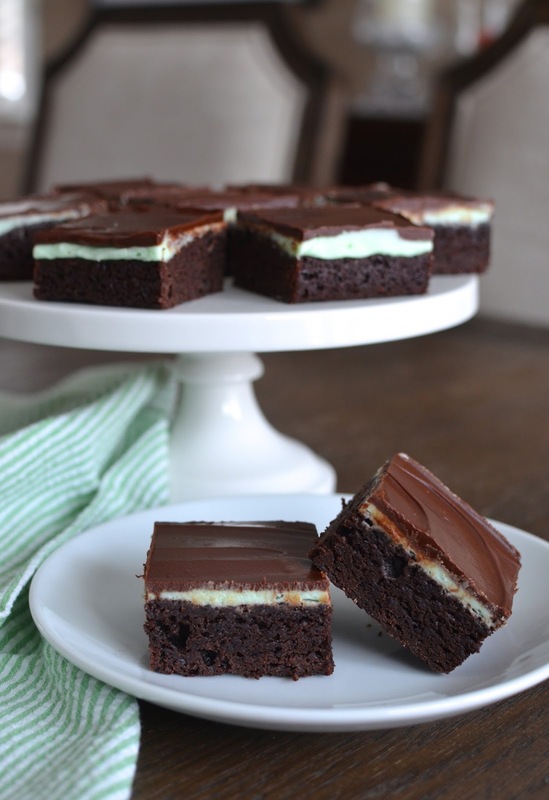 Chocolate and mint is a great combo and these look so pretty and delicious. These would be perfect for St. Patrick's Day. I am currently on a chocolate mint kick and these bars look sooo good! Plus, I always love the pale green color in treats like this! I am always on a chocolate + mint or chocolate plus orange/hazelnut/almond kind of kick on rotation. It's all about the chocolate for me. And I agree on the pale colors...a single drop of green coloring was all it took. Wow Monica - these are gorgeous! I tried making a version of these with Bailey's Irish Cream but they turned out awful. You nailed it. Hope you're digging out from all that snow :) Enjoy! You set a much higher bar for yourself than I do, Tricia! I'm sure your bars were delicious. We are out from the snow but boy, is it icy out there. It really reminded me of what a hard winter is like...we'd been so lucky. Hopefully, spring is coming! I would love to eat one right now, yum! They do go down easy. So perfect for today! My favorite part would be the chocolate glaze, too ;) I never used to like chocolate + mint but grew to love it (and now hoard boxes of Thin Mints haha). Have a great weekend! These look so so good and perfect for a St. Patrick's Day treat (or, any day, really). Pinning these to try. I love chocolate + mint. Sounds good. Hope you enjoy them! Oh how did this recipe slip by me, chocolate and mint!!!! wow these look delicious. These are perfect for anytime of year, I can see myself making these often. These are fantastic Monica! Beautiful bars! I love the crumb of those brownies and the glaze seems perfect! My husband and I had a dessert similar to this at a party we went to that he really enjoyed and now I have a recipe. Thanks! These sound so good. Look at that glaze layer! Really nice cut into smaller squares to place on a dessert tray for tea. Happy Spring to you, too! !